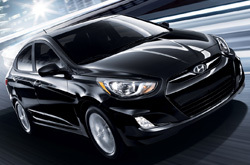 You can find a complete 2013 Hyundai Accent review below the video. All Hyundai retailers in Fort Worth are not alike. We feel it's our obligation to supply customers with quality Hyundai reviews that set us apart from the typical retailer. This Hyundai review article contains everything you need to know about the Accent and it's specifications, mpg and more. Get started by watching the video below or move on to the full review. 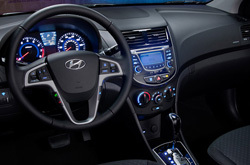 By examining the 2013 Hyundai Accent alongside the 2013 Mazda2, Nissan Versa, Chevrolet Sonic, Ford Fiesta and the Toyota Yaris, and you can realize that the Accent outshines those autos in numerous zones. Browse the hightlights below. Vandergriff Hyundai auto repair service in Fort Worth is only a click away! Your Hyundai deserves to be treated with the utmost respect - that means Hyundai factory- trained technicians, accredited 2013 Hyundai Accent parts, and the peacefulness that comes from a 12-month service work warranty. With support from Vandergriff Hyundai's car repair masters your Hyundai will run smooth for years. The following is barely a fraction of what we handle: in-cabin air filter replacement, shock and strut repairs, fuel filter replacement and much more. We also handle a multitude of additional services. From the straightforward to the complex, Vandergriff Hyundai does it all and offers cut-rate prices, one-on-one service and masters mechanics. Take a look below to view money-saving service specials.